The moon in Virgo people know what they want out of life at the same time keeping in mind others’ feelings. Virgos are known for their attention to detail, and the Moon in Virgo means they are most content when everything in their life is in order. If you need something taken care of, they are more than happy to handle it for you. Just make sure to show your appreciation. The Moon in astrology represents our feelings, creativity, and dreams. As an earth sign, Virgo is not typically very emotional. 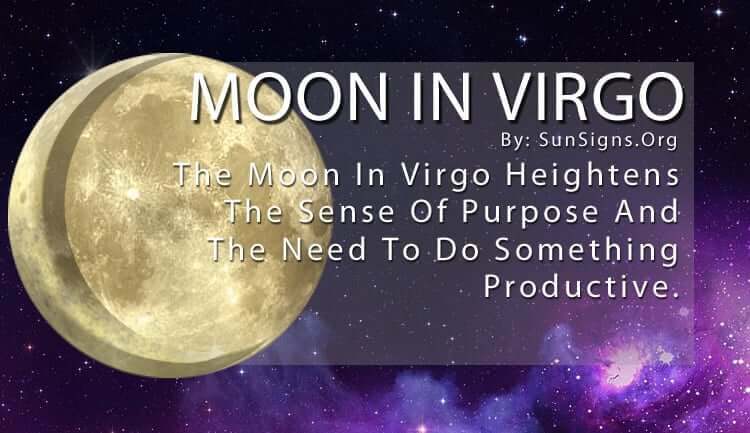 So when the Moon is in Virgo that heightens their sense of purpose and their need to be doing something productive. They often have a routine they follow every day, and if anything gets in the way of that they get incredibly stressed. Because of this, they can be perpetually nervous or get agitated at the slightest problem. The Moon in Virgo people prefer to keep things simple to avoid any chaos. They will work hard to maintain a healthy lifestyle. This includes keeping up with bills, chores, and errands that they gladly take care of to ensure their lives are as uncomplicated as possible. They may come off as boring sometimes because they lack the sense of adventure that others have. But they are one of the most responsible and dedicated of all the zodiac signs. This means they like to do things for other people. The Virgo Moon sign makes them even more generous in taking care of their friends and family. They are very detail-oriented. Thus, every party or gathering they have is entertaining with a specific theme geared toward their guests’ enjoyment. They Lunar Virgins are known for the little touches they add to everything. This also means they are the ones to go to if you need anything specific because they’ve already anticipated their future needs and the needs of others. That’s how they show their love and affection, for they aren’t emotional people. Instead, they will go out of their way to make things easier for you. Just be careful not to criticize them, though, especially those with the Moon in Virgo. Since they tend to be perfectionists, they can get hurt easily when others don’t appreciate their efforts. They strive for everything to be “just so,” and if it isn’t then, they take that as a complete failure. The ironic thing is that they can be very critical themselves, always telling other people how something can be done better. They aren’t trying to be bossy. But the Virgo moon sign usually come off that way which can be very annoying. Some people find the Moon in Virgo people to be a bit cold or too practical for their good. But those who know them well understand that they use their talents to help people. And, those talents are most valuable in the real world. Because you can always count on them to be there for you. They make excellent counselors you can go to for advice. Lunar Virgos often rain on the parade of anyone who isn’t as practical or rational as they are. If they aren’t careful, they can easily take the fun out of a situation. But that’s never their intention. They sometimes have trouble seeing the bigger picture through all those smaller details. And they are so busy they can forget to slow down and enjoy what’s going on around them. But they will never steer you wrong and will always have your best interests at heart.